We're Expanding Into the Great Wide Open! Put me in coach! 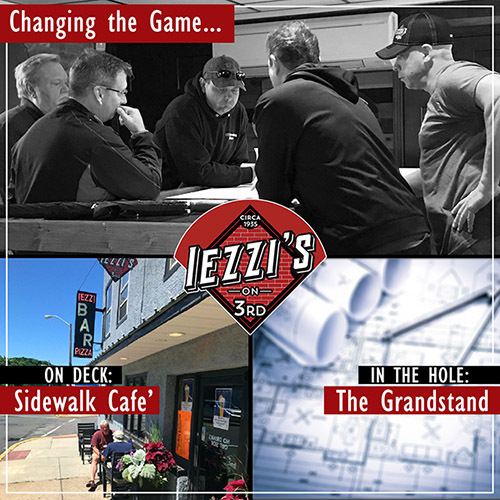 Big plans are underway at Iezzi’s On 3rd as we approach the 1st anniversary of our grand reopening following the completion of a substantial remodel in 2017. Not ones to be complacent riding the pine, we’re ready to play! Plans are in place to significantly up our game as Boyertown’s Favorite Neighborhood Bar. Our extensive upcoming expansion will give locals and newcomers alike a unique atmosphere that is a comfortable, attractive, functional, fun and inviting destination location – indoors and out – to hang with old friends and meet new ones. Patrons will enjoy expanded live entertainment, great quality food including a variety of new weekly specials from our talented chef, and a large selection of refreshing beverages. We have opened an outdoor seating area on the front sidewalk where customers can enjoy a comfortable lunch or dinner in the shadows of Boyertown’s historic grand structures on beautiful seasonal days in the great wide open. Our friends, at Iezzi’s On 3rd the future is wide open… daily at 11a. The blueprints have been drafted, the diamond has been designed, permit applications are being reviewed, there’s new grass on the field, and details are being hammered out for “The Grandstand”; a spectacular new open-air covered free-standing #SportsBar addition with a 2nd-floor lounge - out back of the current brickyard building - extending toward the parking lot. “The Grandstand” will provide patrons the opportunity to enjoy their food and beverages in a comfortable outdoor atmosphere on two levels on fair-weather days with multiple TVs and ample seating. Folks will undoubtedly know... Iezzi’s is! Keep your eye on the ball. We’re headed for home! June 22 2018: "Rounding First" - We received a letter from the Pennsylvania Office of Regulatory Affairs stating that they have approved our application for extension of license to cover additional premises as requested! June 28 2018: "Heading For Second" - Iezzi's Sidewalk Café is NOW OPEN!! Join us in the Great Wide Open on Reading Ave and enjoy Burgers and Brews outdoors at the all new Iezzi's Sidewalk Café!